Those magazines are pretty to look at sometimes, but they’re so unrealistic for most budgets, and they make us desire more than what we already have. It’s a recipe for disaster, so I say don’t even both with those fancy decorator magazines. Who wants to actually live in a decorator-style home anyway? Personally, I want my own stamp on things, and I want to do it on a dime. 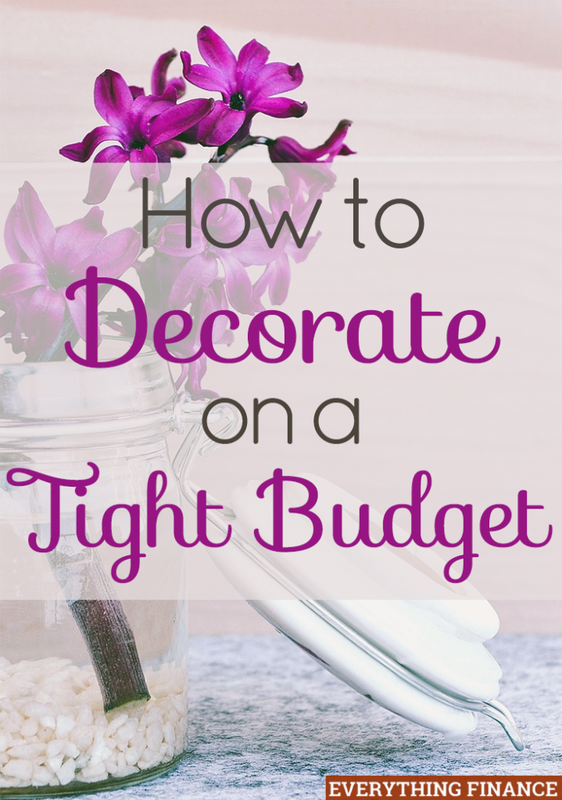 There are so many ways to change up a room and redecorate without spending a fortune, so here are my best tips on how to decorate on a tight budget. The cheapest, fastest, and easiest way to transform an entire room (or rooms!) is to buy a gallon of paint and go to town. You can add major character to a room with a bold new color or add airiness with a soft pale shade. The possibilities are endless. Grab a few paint samples to take home first. This will help you choose which shade you want before spending money on a gallon of paint. Next, research what kind of finish you need for the room, and then get to painting. It only takes a weekend to transform an entire room. If you want to be really thrifty, you can even use the leftover paint samples to add some charm to other small areas. I once painted the inside of a small closet with a tiny sample of paint! You could also paint the backs of your cabinets or the back wall of a bookcase. It adds instant (and frugal) charm. This is one of my favorite ideas. I love hanging unexpected things on my walls because they always draw a lot of interest and become statement pieces. When I’m out antique shopping or at an estate sale, I like to find things I can re-purpose on my wall. I’ve hung vintage wooden cutlery drawers, a card catalog drawer, and vintage bottle crates on my walls to serve as shelves to hold other interesting items I want to show in my home. That way the whole display makes a statement, down to the shelving. You could also look for old crates or boxes to hold items in your bathroom (towels, soaps, washcloths) within easy reach on the wall, or hang old records and trays as retro-cool decorations. If you have zero money to spare, try rearranging your furniture. I’m constantly rearranging the furniture in my own home to keep things feeling fresh, and you should, too! If you can’t stand the thought of removing all of the furniture from an entire room, measure the dimensions of the bigger pieces, scale them down to inches so you can cut them out on paper, and rearrange your furniture on paper. This way will prevent a lot of unnecessary moving and you can get a sense of what furniture fits (or doesn’t fit) on each wall. The whole process takes only a few minutes to set up, and it can be quite handy, especially if you live alone and it’s hard to move furniture around. I’ve painted old medicine cabinets, wooden caddies, an old record holder, and even chairs. You can pretty much spray paint anything these days, and if you want to paint it, then they make a specialty paint for it. They typically don’t cost more than 5 bucks a bottle, so it’s a must for a frugal DIYer. The best thing about it is that local big box stores now carry tons of colors of spray paints because so many people like to DIY these days. My suggestion is to take the item outside on a windless day, lay it on some newspaper, tape off the necessary parts and sand it if necessary, and go to town. Don’t forget to wear a mask and use gloves to protect yourself from the fumes. Open shelving in kitchens is definitely having a moment, and it’s easy to try out if you want to see how you like it. If you want to try it out but aren’t ready to commit just yet, remove a door or two in your kitchen (but keep all the hardware and the door) and live with it for a few days. If you love it, then great, but if you hate it, no big deal. You can put the doors back on, enjoy the photos in the trendy decorating magazines, and move on with your life. If you do decide you love the look, do realize that you’ll need to keep those particular cabinets nice and tidy all the time, or the look will be lost. I can’t tell you how many times my family and I have swapped around furniture to achieve a new look. Beds, nightstands, couches, chairs, you name it, we’ve switched it. Let people know you’re looking for certain pieces, and they may just appear out of thin air. Hand-me-downs are a great way to redecorate, and that doesn’t necessarily mean you have to only take castoffs that are in such poor shape they belong in the dump. People get rid of furniture all the time, whether they’re moving to a new place or are just tired of a certain piece. My younger brother practically furnished his bachelor pad on family hand-me-downs. If a certain free piece isn’t quite your style, study its lines to see if you could do something to make it your style, such as recover it, stain it, or paint it. Estate sales have the best furniture (especially if you’re into retro finds) because everything in the house is typically an older style, meaning it’s made well compared to pieces from today. When I pull up to a new estate sale, my heart starts pounding, and I feel like I’m in a race to get to the best goods first. You can also find tons of great mid-century modern pieces, which are really trending right now. What’s better than owning an authentic retro piece rather than a new made-to-look-old piece? I hope I didn’t lose you at wallpaper, so hear me out. Wallpaper has gotten a bad rap in the last decade or two, but it’s making a comeback, and a lot of it is really cool. The thing is, you don’t have to go crazy with papering a wall, you can just do small areas for big impact. When I found some amazing retro wallpaper at an antique sale, I jumped on it for only $12 bucks. I papered the back wall of my small laundry room, and I kept my laundry door open for months just so I could admire it. Who would have thought a plain laundry room could turn into a statement room? I then used the leftover wallpaper to paper the back of the record holder I spray painted, but you could also use leftover paper to cover the back of a bookcase. This one took me a long time to muster up the courage to do, but go ahead and check out that pile of furniture you spy at the curb in your neighborhood. It’s not gross — people throw out perfectly good things all the time, especially if they’re in a hurry to move and can’t find someone to take their furnishings. I used to worry what people would think if they saw me doing this, but now that I see people do it all the time, I realize that no one cares! If you’ve tried all the tips above and still feel like your space is too sparse, consider embracing minimalism. Decorate with whatever you have, and don’t worry if you have a blank wall or two. Tell people you’re a minimalist and learn to be happy with what you do (and don’t!) have. After all, too much decorating requires more dusting, maintenance, and cleaning, and that may not be your thing. Once you learn to embrace a few blank spaces, when you eventually have some extra cash to spend on furnishings, you may find that you actually like all the extra space you’ve created for yourself and decide you don’t need anymore. And that is a great place to be! How do you decorate your space on a budget? Do you enjoy shopping at second-hand stores or estate sales? Typically I do not understand posting with weblogs, however wish to state that this write-up very compelled myself for you to do that! Your writing preference has become stunned my family. Appreciate it, great document.